Our commitment to our roots continues with the GEO, the newest and most advanced transit we build. Listening to owners of our pocket transits, and implementing some of their ideas, we have created the ultimate tool for professionals. Our billeted aluminum, waterproof GEO Transit contains a fast, magnetic north seeking, rare-earth magnet, balanced on a sapphire jewel bearing for quick measurements. 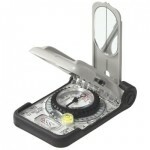 The most noticeable feature is the hinge inclinometer, accurate to +/- 2 degrees. This feature allows simultaneous trend and plunge measurements reducing the number of measurements you must take in the field. An innovative needle design can be locked or unlocked depending on your requirements. 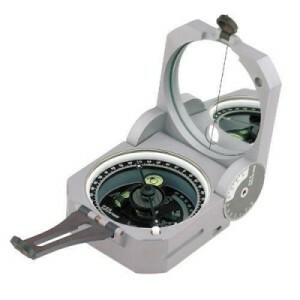 The compass also takes vertical angle measurements to +/- 90 percent (or 100 percent grade), with 5-percent grade scale increments. And users needn’t worry about imprecise results, as the compass’s vertical and azimuth readings are accurate to within +/- 1/2 degree (with 1-degree graduations and 10-minute readability for both). 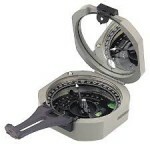 Additional features include “Buck Horn” style sights for increased accuracy, a single NdFeB magnet that resists demagnetization better than other magnets, a cover hinge assembly designed for increased durability, a precision-aligned mirror with convenient “see-through” sighting capability, and magnetic declination adjustment with east and west declination settings to 180 degrees. The Geo Pocket Transit, which boasts a 0-to-360-degree scale and comes with an attractive leather case, measures 3.62 by 2.81 by 1.31 inches (W x H x D).